Bevor der Artikel gelesen wird, ist zu empfehlen den Unterschied der Körperteile „Bein“ und „Fuß“ aufzufrischen. Aufgrund vermehrter Erfolge von Leglocks vor allem in Submission-Only-Turnieren, steigen Interesse und Beliebtheit dieser Submissions besonders von Heelhooks. Andererseits sind diese Griffe wie ein Schatten im Dunkeln, vor dem man sich fürchtet. Doch wenn man dieser Ursache auf den Grund geht, merkt man, dass es nur das Spiel von Licht und dem flackernden Vorhang war und es keinen Grund zur Sorge gibt. Ähnlich verhält es sich bei Leglocks und man erkennt die Struktur dieser Techniken. Zunächst muss sich bewusstgemacht werden, ob man die Guard passieren kann und gezielt einen Beinangriff startet oder ob man an dieser nicht vorbeikommt und daher auf die Beine geht. Diese Punkte lassen sich auf alle Leglock-Positionen übertragen. Erst wenn die Kontrolle stabil gehalten wird und man wie ein Blutegel am Bein des Partners festklebt, erfolgt der nächste Schritt. Die Ferse ist eine relativ kurze Zeitspanne freigelegt, in der der Submissiongriff angesetzt werden kann. Nun ist es für das Training äußerst wichtig, nicht direkt den Aufgabegriff zu finishen, sondern die Kontrolle des Griffs zu stabilisieren. Das fördert die Erfahrung und das Verständnis der Situation sowohl für den Angreifenden als auch Verteidigenden. Dadurch soll die Angst verringert, der Respekt vor diesen Submissions aber aufrecht erhalten bleiben, mit dem Wissen, dem Trainingspartner vertrauen zu können und gesunde Knie zu behalten. Sobald der Griff solide sitzt, nennen wir es Catch, wird der Hebel mit einigen Details recht leicht und vor allem sehr schnell abgeschlossen. An dieser Stelle ist es bedeutend zu erwähnen, dass im Knie ein geringeres Schmerzempfinden wahrgenommen wird, als beispielsweise in den Armen. Ein wirklicher Schmerz ist oft erst dann spürbar, wenn eine Verletzung der Kreuzbänder eintritt. Zusätzlich weisen unterschiedliche Trainingspartner unterschiedliche Rotationsdehnbarkeiten im Knie auf. Da bereits einige Millimeter mehr eine Verletzung ausmachen können, ist erhöhte Vorsicht geboten, besonders bei Heelhook-Neulingen. Eine Möglichkeit zum Heelhookfinish, die jedoch schwer dosierbar und eher brachial zu bewerten ist, ist seinen Oberkörper samt Ferse des Partners zu rotieren. Die Bewegung des letzten Details lässt sich mit dem technischen Finish einer Guillotine vergleichen: der Oberkörper wird nicht nach hinten (bei Heelhook seitlich) gestreckt, sondern der Raum zwischen eigenem Arm und Körper verkleinert durch eine Rotation auf Frontalebene indem die Schulter seitlich Richtung Becken geführt wird. Beim Heelhook ermöglicht dies eine langsamere und kontrollierbarere Druckbewegung auf das Knie des Partners. The half guard, also known by its Portuguese name: meia–guarda, is a ground grappling position that is in the middle of a full guard & side control. It was greatly developed in the mid-1990s by an outstanding BJJ competitor Roberto “Gordo” Correa. He is the one who has revolutionized the half guard grappling position. Professor Gordo himself said that he didn’t invent the half guard; it was already there. The contribution he had made was to make half guard more offensive. He started developing attacks and sweeps from there so that’s why he is calling the major contribution he has made to the martial arts especially BJJ. Professor Renato had the privilege to learn much half-guard techniques from Professor Gordo and Prof. Gordo was Professor Renato’s first instructor. Eventually, Professor Renato had to move out of town & he started learning half guard under the Master Ryan Gracie who has been recommended by Professor Gordo. Nowadays, many people are doing half guard. It is actually the evolution of what was called old school half guard or the half guard that Professor Renato had learned from the Professor Gordo. And also, two guys named Bernardo Faria & Lucas Leite are doing great with their half guard game. Mr. Bernardo Faria is doing deep half guard, which is a very efficient & very straightforward game. One extraordinary thing about the deep half guard is that it can help you enter into it from a totally defensive position. Its very oriented to either sweep or take the opponent’s back from that situation. He also uses single leg half guard which is a solid wrestling technique. It can help you escape off the bottom position. Professor Renato called this sweep the pigtail sweep. It seems like it is just the same technique, but Mr. Faria is actually developing great techniques from there. In addition, Professor Renato is studying some details on that. Actually, he is stealing this from Bernardo Faria & Lucas Leite. This is like a mastermind. Many people are thinking together about BJJ. The different grips, details so that’s what is making Jiu-Jitsu develop. Also, Mr. Leite is the other person to whom we should blame for the development of the 2.0 half guard. Now, he is calling it “The Coyote Guard” & put in there a very, very smart detailed system. Lastly, we are very thankful to our BJJ community for this masterminding or brainstorming like Bernardo Faria & Lucas Leite has done to half guard. Thanks to them for sharing with us their techniques which they have developed throughout their training and competitions. Our Half Guard Old School 2.0 class will be a mix of the old school fundamental sweeps for the understanding of single leg; deep half guard & the coyote guard techniques. Students will be going to learn how they can use their body efficiently to control space, how they can apply pressure & move about at the same time, learn the different little movements to make an effective escape, how to lock a person in submissions with less effort. Why should we train certain techniques in BJJ? We always blame Brazilian Jiu-Jitsu to be one of the best self-defense around, but it’s going to continue to be the best self-defense. That’s if practitioners will continue learning all the martial arts. 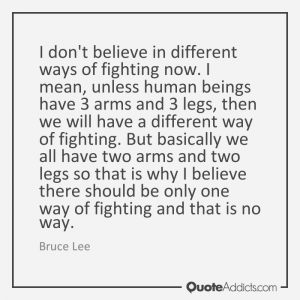 And also, if they use and understand the way on how to use BJJ as a way of self-defense as a way to counter any other martial art. Lately, the Brazilian Jiu-Jitsu has got so specific that people were just training with their BJJ partners. They are forgetting to do the cross training and the mixed training that once made Brazilian Jiu-Jitsu the best self-defense. Many BJJ practitioners only know how to react to a BJJ person. But, some of them are having trouble reacting with a wrestler judo or Sambo athlete. Of course, we are talking about the comparison of a very skilled BJJ black belt with another very skilled Judoka, wrestler or Sambo. We want to compare BJJ to a higher level in the different martial arts. So at our training, we are looking to get our students exposed to all the martial arts like Judo, wrestling, & etc. These martial arts do a position called a Heel hooks, Scissor takedown, Sumi Gaeshi sacrifice throws. Although some of these are banned from BJJ tournaments for being extremely dangerous, it’s still better to be acquainted with these illegal submissions. You’ll be ready to go when somebody tries to apply them against you. A large number of these illegal BJJ submissions have a ton of legitimacy for the self-defense situations or MMA applications. Thus, they are well significant to learning! And should not be banned from classes just because they are not legal in tournaments. Even if you don’t plan to utilize them to finish your opponent, you will still be required to defend yourself properly against them. Usually, these dangerous submissions training are not given to the people. When they face situations in which their opponents use these submissions, they eventually end up getting a submission. Lack of realistic training will make the most efficient self-defense martial art look silly. At our training, we understand that trained people react right and untrained react wrongly. Wrong reactions should be added to training situations. You never know who you will have to defend yourself against one day. 1. Basics: If you want to develop your game plan, you have to master the basics first. For me the basics should be mastered becoming a blue or purple belt. This means you know most of the submissions. 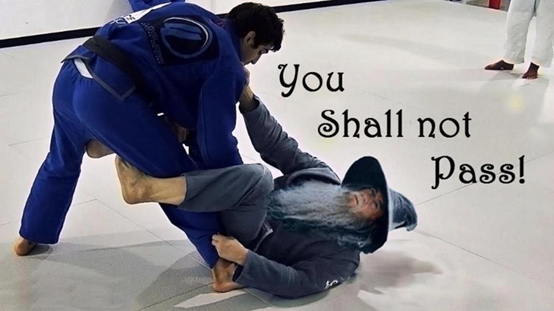 You have trained to know the difference between Self-defense and Sport Jiu Jitsu. You know how to position yourself on your partner and you have knowledge of the close Guard and start to play more open guard now. To develop a game plan you need to have an understanding of the anatomy and body movements your training partners are doing. In which direction can he bend the arm, which one is physically impossible? When I am on top in which direction can the partner move? We all have two arms and two legs so we all move in a similar way. In the beginning everything is new and every move is a surprise for me! As long as a move or a submission is surprising I cannot defend it. After a while you know what the partner is able to do in certain positions and what not. You know the most common mistakes and how you can avoid them. You cannot defend what you do not know and do not see coming! 2. Plan: Now you know the basics of the game. Probably you already have your blue or purple belt and start to feel which movements fits your body, your size, your anatomy an your way of moving. Then you start to develop a plan. a. You have long legs: Your goal could be to pull guard and start attacking with spider, lasso or collar and sleeve guard. Perhaps you feel more comfortable in your guard than on top, but you like to submit from your guard or sweep from there. b. 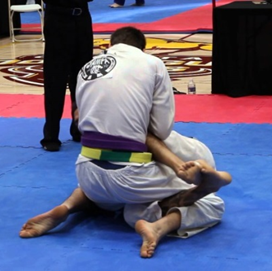 You like to be on top – or you train BJJ for MMA: In MMA it is always better to be on top, so your goal in BJJ is also to give pressure from the top. Perhaps you are not the fastest one and that’s why you like to pass with pressure, pin from the top and give the opponent only one way to escape and that’s where you are waiting to make him tap! c. You are a small person; you are not the strongest one: You never liked to squeeze and pressure all the time. Your plan is to pass very fast with some kind of speed pass, you want your partner to move so that you can take his back and submit from there. All these plans are more an idea and sometimes you can switch in between them. If you have trained long enough you will have to have some speed passes, some pressure passes, escapes, a top game as well as a good guard, guard defense and recovery, but if you can choose you know what you prefer. This is what I understand as a plan. Every plan can go wrong but you already know what you want to accomplish in an “ideal” fight. Even if you have a plan, do not make the mistake to close your mind. If you have the possibility to visit new instructors, go to a seminar or a camp – try to stay open-minded. Even if the new techniques do not fit your game it is good to know how your partner could possibly move or react. Perhaps one day you want to open your own academy – you do not want your students to only become a copy of yourself, but then you need to show them techniques which are not for you!!! 3. Game plan: Talking to high level fighters you can see one thing they all have in common! They want to act and not to react. They always want to be the one to push the pace. Be the first to attack, have the first grip, be the first to move. As soon as you start to defend you are one step behind! You need to drill defense and escapes, too, but your game plan should be based on attacking. If you watch how kids grow up, you can see how they try to copy their parents. My students start to do the same. And I think in the beginning there is nothing wrong with it. You trust your instructor; your instructor guides you and introduces you to the world of BJJ, submissions and a lot of taps. But a good instructor tells you when it is time to find your own way. If you start to develop your game plan you start to step out of the shadow of your instructor and start creating your own footsteps. I cannot remember who it was but one BJJ instructor once told me: “If my students start to develop their favorite submissions, start to develop their own style of fighting, start to develop their own game plan than I know I did a good job and I know I do not have to worry about them anymore because now they have the knowledge and start to educate themselves now!” Believe me, we all need an instructor in the beginning and later on when we get stuck and do not know any solution for some problems but later on the instructor is more a mentor, a guy to look up to, a person who introduced me to Jiu-jitsu and taught me the basics. Someone who will always care about you, but someone who wants you to stand on your own feet! I will never forget that day when I lost a competition and my Prof. – Renato Migliaccio – told me: “you do not even need to tell me what you did wrong – I know it already – you let him get to close!” Ever since, I think of this sentence a lot. Most of the times when I lose in rolling or in a competition it is exactly because of this very reason. The guy passes my Guard and when he smashes me I try everything to get my Guard back but in most cases, it is too late. As a conclusion, of course I need to get better at different Guard forms I use, but also to improve my Guard recovery. I spent a lot of time watching BJJ DVDs, invested money in online training in order to better develop my Guard game. But in the end, what helped me the most was watching videos of my own rolling session and fights over and over again. The basic position hierarchy is common sense in BJJ today. One of the first principles you learn is: “Position for submission”. I think this principle has changed a little bit over the last years because the submission-only-events are increasing and you do not get points for any Guard pass or position anymore. That’s why people like to attack the legs in these events a lot. But still, if you start to learn BJJ, if you want to understand the art better and if you want to understand the game in all aspects and not only for submission-only-events, this position hierarchy is still up to date. So the position where to involve from is the Guard. If I want to pass, I need to pass his Guard first and start to climb the position hierarchy to the top or to submit on the way to the back. If I did too many mistakes he ends on my back and I need to try to get back to my Guard position. So Guard is key!! The Guard is also one of the main reasons why BJJ is different to other grappling arts. In wrestling, for example, when you pin his shoulders to the ground for a couple of seconds you win. In BJJ nothing happens if your opponent is in your Guard. You are still safe! We all started to learn the close Guard as our first Guard position. Later on, we opened our legs and began to play all kinds of open Guards. Like Spider Guard, Lasso Guard, X Guard, Dela Riva, Reverse De La Riva, HalfGuard and so on. Playing Guard we learn to control the distance between the opponent and ourselves. The better we can outbalance him, the better we can control the distance and the angles, the more chances we have to stop him from passing and to improve in the fight. bring yourself in balance: if your posture is not good you cannot have a good balance and at the same time you cannot outbalance/sweep your opponent. To get in the right position and to get the right angles you need to work with pushing and pulling your opponent. how can you deal with his pressure? his weight, his weight distribution is used to put pressure on you and pass your Guard. The Guard is there to deal with the pressure and not to let him use his weight to pass your legs. 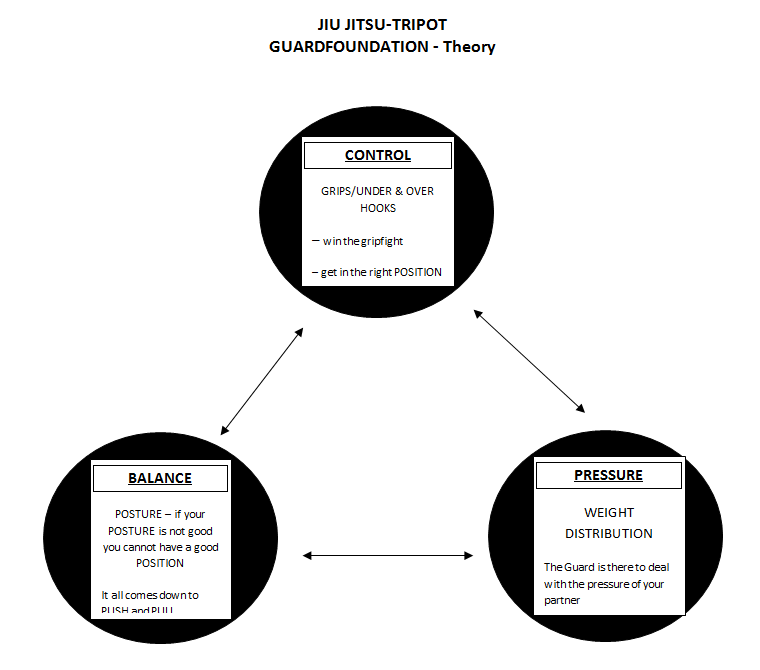 This Guardfoundation-Theory was introduced to me the first time training as a white belt in New York at the Renzo Gracie’s Academy. 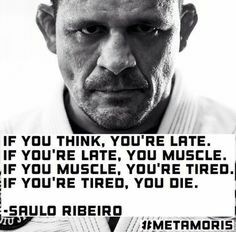 Now as a black belt, one of the instructors I like to train with is Prof. Carlos Maia from Gracie Barra Ljubljana and he explained this theory to me again. Sometimes people can tell you the biggest secret but you are not able to understand it in your current situation. Today it makes much more sense to me and I could understand and use much more of this theory in training. After getting tapped 12 times in 10 minutes by a high level BJJ genius I realized that he is following some Guard hierarchy. Not only for the positions but also for his Guard he followed some hierarchy. Trying to pass his Guard he always used his legs to keep distance. So he always stared to used the Spider Guard or something similar. Was this planned or happened by circumstance? I thought about this experience rolling with him for a long time and started to realize that he used the Guards are not used randomly. There is a situation when and why to use Guard forms. I started to put the Guards I know in an order starting with the Guards which control the biggest distance. Depending on your body type you have to find a Guard form which fits you. But as you improve in BJJ you need to be able to transition between different Guard forms. When he passes your Guard it does not mean that he passed your Guard – but he passes your first distance of Guard. Now you have to switch to the next. Here is my list of open Guard forms where to switch too. Having this open Guard-Hierarchy in your mind it can help you learn in a more methodical way. Work down the distances for your Guard if you want to improve faster. You need some principles to follow when you teach but also when you learn. Your students or you are going to improve faster when they learn and understand this. Of course there is no need to be a black belt in all of this open Guard forms. But you definitely need to understand the close Guard and some open Guard forms. As a teacher you never know in which way your students are going to evolve but you have to give them the best start possible. I do not want my students to become the copies of my game one day. I want them to form their own game plan. This is why I need to teach all Guard forms and plant some seeds into my students’ heads. Some are going to develop a game which is so different from mine and the whole academy is going to improve from this. A beginner does not know that his anatomy is going to show him which moves, which Guard forms he is going to be able to use in a better way than other students with different bodies. I also think that it is inevitable to start to teach the close Guard first. The close Guard teaches the basic principles of the Guard. Even if you do not use the close Guard later anymore you have to start to learn this Guard first. Not only because of NoGi and MMA but also because of the Self-defense aspect of BJJ. A lot of students start our martial art because they want to be able to defend themselves and switch to the sport of BJJ later on in their BJJ carrier. The instructor should know the art better than his students and even if students want to learn cool new stuff if we do not respect the basics we miss teaching the roots of our art.